This is an outfit of favorites for me. The shirt is one of my go-tos. It's a vintage boy's shirt (hence the pulling), but I just love the stripes. It's so good at dressing down a lot of things that may otherwise FEEL too girly. The barrette is a gift I just got in the mail from my friend Shana. I don't know if you can tell, but there is a tiny gold accordion on it! The shoes were a Christmas gift from Johnny a few years back, and I almost returned them. I really didn't know how much I would wear rubber rain flats, but they are so great for rainy days when I don't feel like wearing my Hunters. He knows me. I'm looking SO forward to enjoying this weekend. It's not often that we have down time where we don't have to be SOMEWHERE and I plan on soaking it up! Poe's feeling under the weather, but still in good spirits and I have a few projects under way that need some attention. It sounds like the perfect weekend to be home! Happy Friday! Love the bag! And the outfit combo is just great! oh that barrette is so adorable! and I love the idea of rubber rain flats...genius! I love this outfit, the mix of the two patterns looks really good. And your hair is amazing! Absolutely darling, as always! And your hair looks so pretty! Love everything about this! The shirt is perfect. Hee hee... thank you muchly! I'm glad I'm not the only one who wears boys clothing sometimes. :) Love your pattern mixing and adorable hair pin! Hope you have a restful weekend! Yes! It seems like most of my favorite shirts are boys. The skirt is so much fun! Lovely skirt! I love dots =) A very sweetie look. oh man. boys shirts are the best best thing ever. when i realized that i think it changed my life forever. if I saw all these items separately, I don't know if I'd ever think to rock them together! Job well done Katie you totally made it happen in the coolest casual way - PipPip! Oh man, this outfit is super good. This outfit is stunning! :) I hope you have an amazing weekend! Sounds like a fun, cozy weekend. Happy Friday! Lovely outfit! 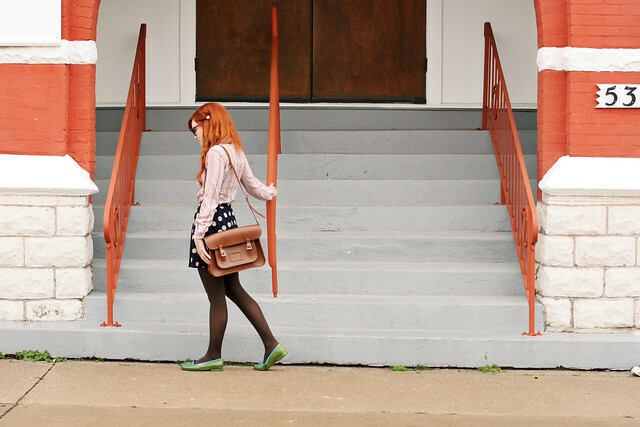 I love the mix of patterns, and the cute green shoes. 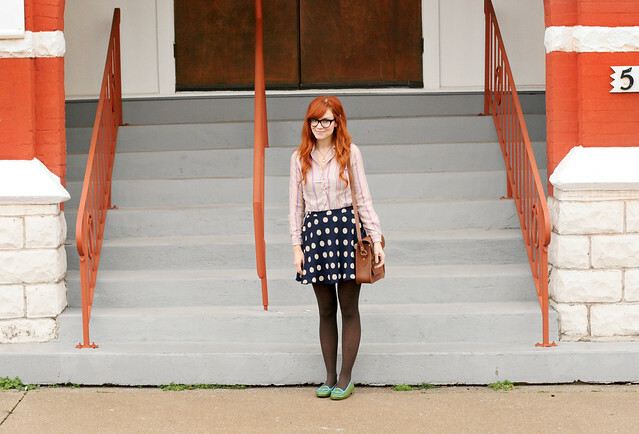 I love this outfit, the skirt is great and the barrette is so adorable. you are so cute as always! So pretty! Enjoy your weekend! That bag is SO adorable! Also, I am loving the glasses in these photos! Katie I love your blog so much. Your outfits are adorable, your store is adorable, your kids are adorable, the way you decorate your house is adorable, and you are adorable. I enjoy reading it so much. Thank you so, so much, Leah! You are incredibly sweet! I love the colours in that shirt. So sweet & muted. You look gorgeous as usual. Love the combo of polka dots and stripes! i adore your complexion!! you are very beautiful. love your outfit. i just bought a jacket with the same color and pattern as your skirt; i'm so happy polka dots are coming back in style. xD those flats are rubber? AWESOME! i could totally use some of those. Lovely! I love the skirt and the bag. Those flats have to be really comfortable, since they're made of rubber. Are they? And you are gorgeous! Your skirt is so adorable. Love the polka dots! I love the strips and polka dot look. I don't know why it works but it 100% does!